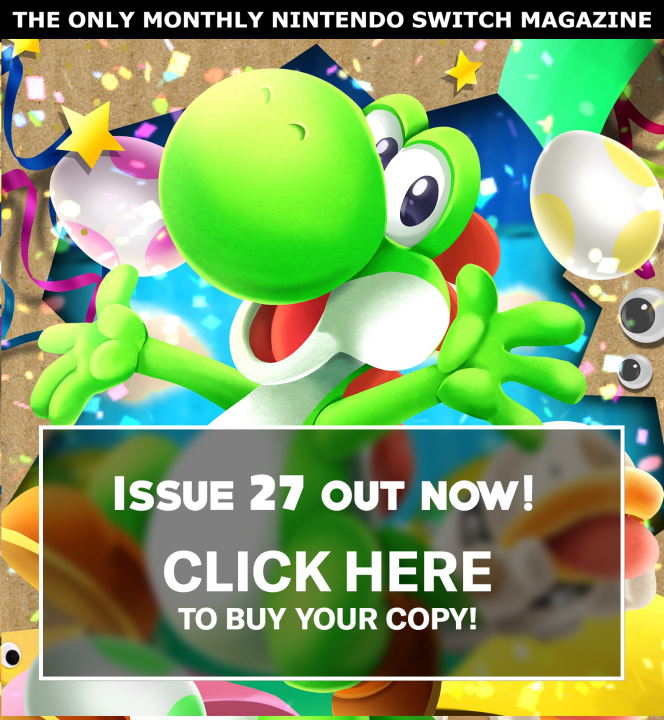 Nintendo seem to have this knack. 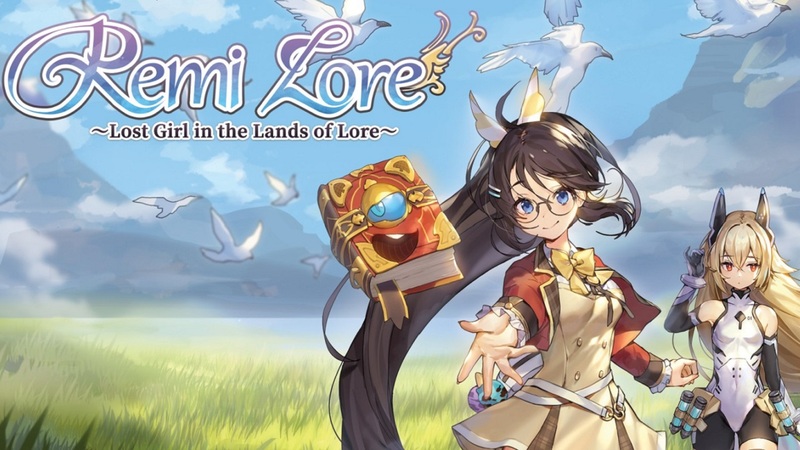 You’ve no doubt seen it many times, but they’ll turn their hand to something new, sprinkle in a dash of that Japanese magic, and end up with an incredibly fresh take on a genre which feels incredibly special compared to its predecessors. Splatoon was their colourful take on the third-person shooter for the Wii U, and remains one of the few success stories from a myriad of disappointments on the system. 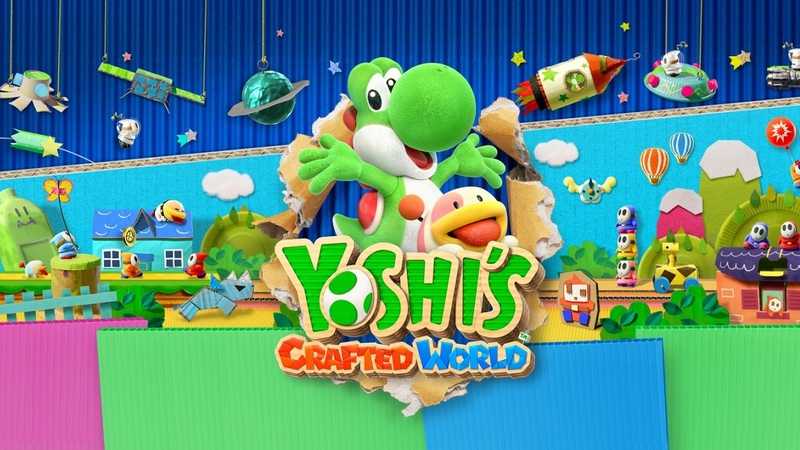 Two years later, the series is revised for a brand new iteration on the Nintendo Switch – resulting in many questions being asked. Does it still feel fresh? Is it a true sequel? Is it even any good? 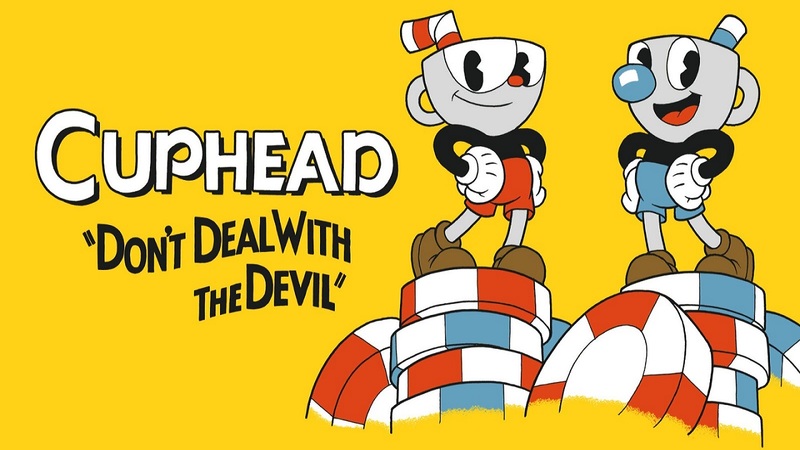 After spending a few hours with the single player Hero Mode, I can confidently say that those that loved the first title are going to love this one as well. 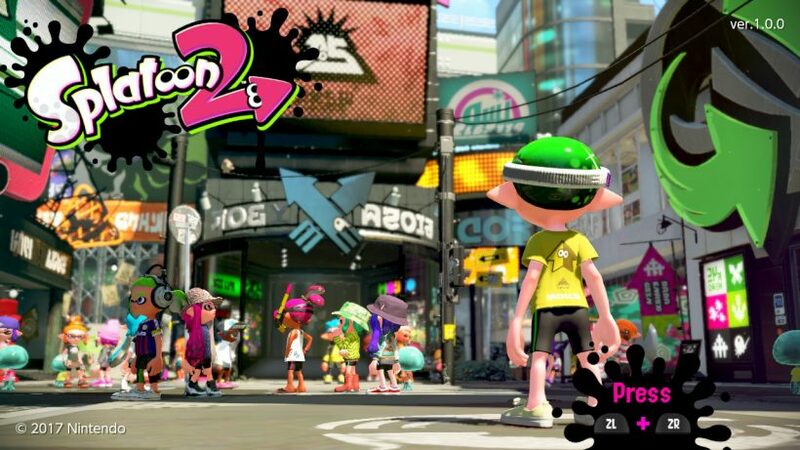 In Splatoon 2 you play as a humanoid with the ability to switch form into a squid, called an Inkling. You start off the game by arriving in Inktropolis on a day that more disaster has befallen the town. Callie – one half of pop sensation the Squid Sisters from the first game – has vanished, and once again the Great Zapfish have been kidnapped. 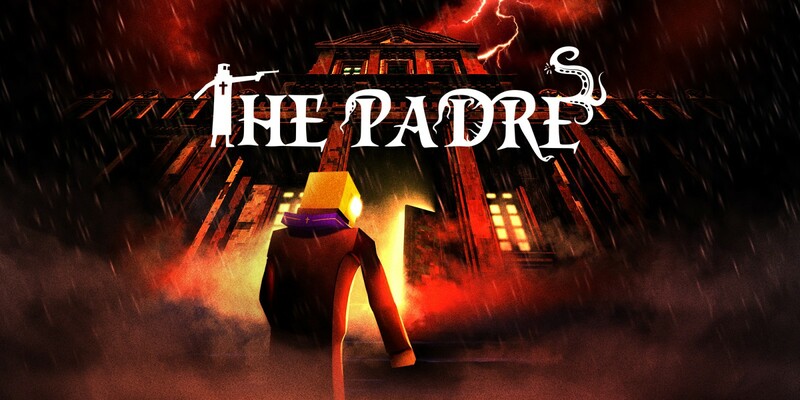 To overcome these tragedies that have befallen the town, you are conveniently recruited into the organisation as “Agent 4” by the other half of the pop duo, Marie, and tasked with fixing everything. This task therefore includes infiltrating the evil Octarian’s headquarters, rescuing the Great Zapfish, and investigating Callie’s disappearance. Hero Mode will see you face off against the enemy forces across five different worlds, located in the depths below Inktropolis in Octo Canyon. Across this preview I’ve been able to experience three worlds so far – and it’s clear that this mode is where you will get to grips with the weaponry available to you in-game, as well as honing your skills for the multiplayer component of the game. As for the gameplay setup, it appears that you control your Inkling with the left analogue stick, and you can either move the camera with the right stick, or by the default method of using the Nintendo Switch’s gyroscopic controls. I’m not a fan of the latter (to be honest), but I’m told it’s how all the pros play! Using the ZR button you’ll be able to fire with whichever weapon you have entered the level with, and holding the ZL button transforms you into your squid form. In this guise you can duck from projectiles, replenish your ink (read; ammo), and move more quickly around the world – so long as the ink you are in is the same colour as yours. B will allow you to jump, and it should be noted that you can also jump (much further) in your squid guise as well. 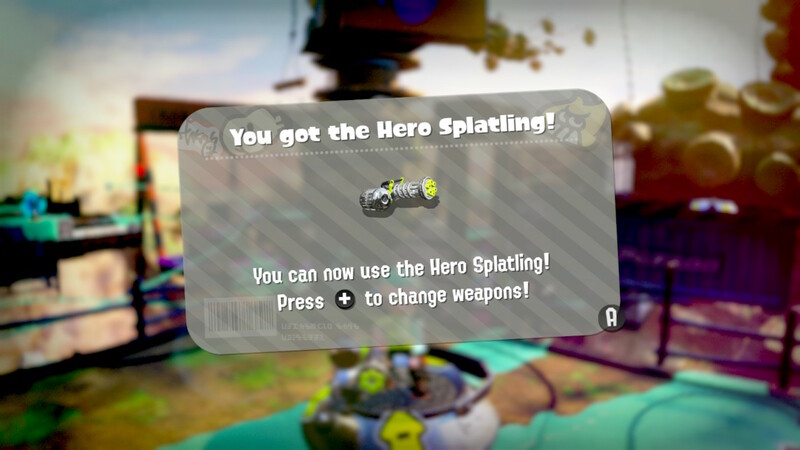 Finally, provided your ink levels are high enough, you can also throw an ink bomb with the R button and execute a special move (depending on your weapon choice) by clicking the right stick when charged. 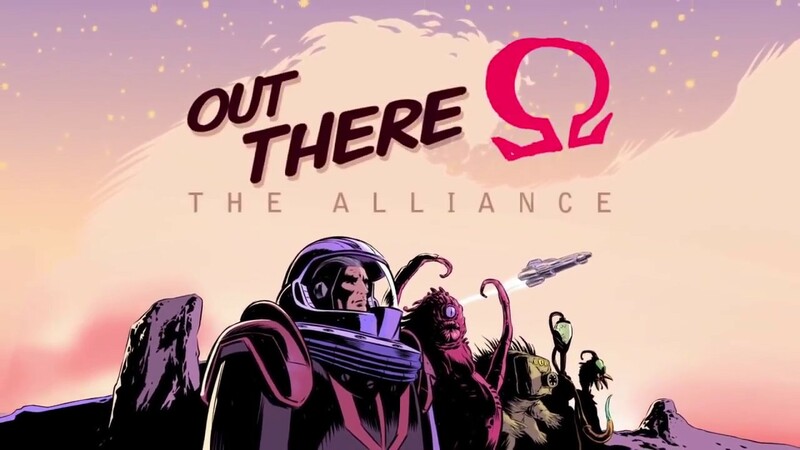 The first of the five worlds is Tentakeel Outpost, and each world serves as a hub with individual missions hidden behind “Tea Kettle” gates (which act as your entry point to each mission). After rescuing the Zapfish contained within each zone, you’ll return back to the main hub – at least until you can activate the “Boss Kettle” and face off against that level’s behemoth. The first world has three missions hidden around you. Once you locate the mission warp point you’ll find yourself in a fairly linear level where you launch from point to point, clearing all of the enemies and obstacles in your path. It’s not as straight-forward as running and gunning as you’ll need to apply your ink to walls and walkways, plus you’ll have to jump from section to section in order to progress. 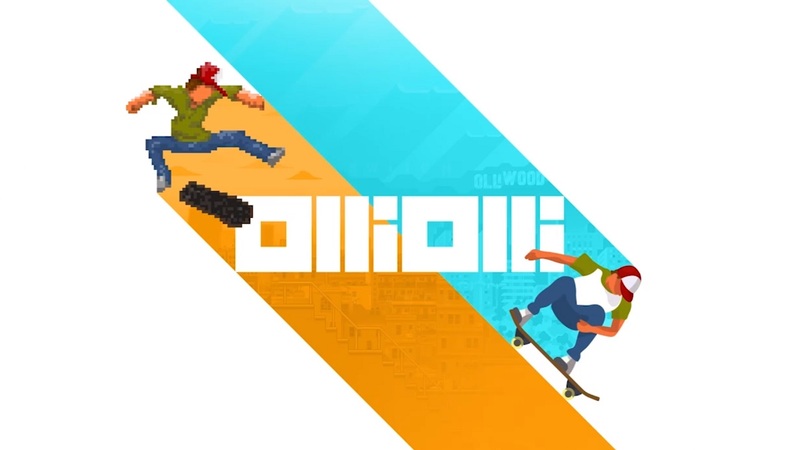 Along the way you’ll need to make risky leaps, avoid gargantuan obstacles, time your moves with switches and glide along rails. 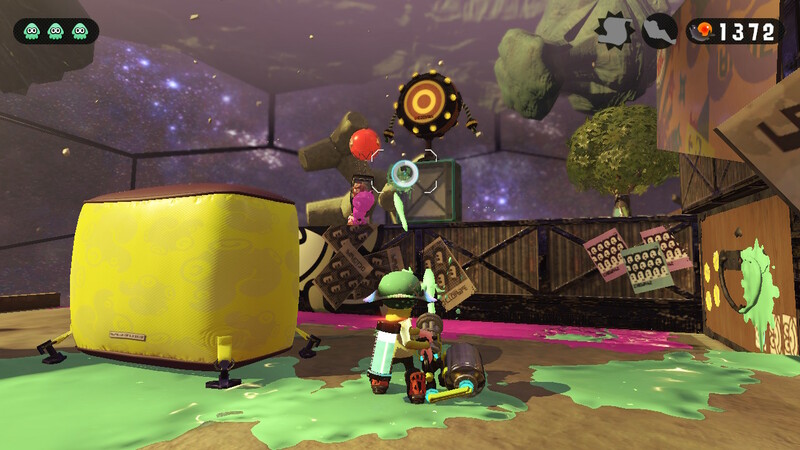 Your foes aren’t there just to be your cannon fodder either, so spraying them with ink is advised until you can progress to the end of the level (and the Zapfish contained therein). Once I collected my first three Zapfish I was able to face off against the first boss which I won’t spoil here, with three distinct phases to it. As a general rule it seems that you dodge attacks, then take your opportunity and destroy the protruding tentacle before it regroups and assaults you with new tactics. Successfully attacking it three times allowed me to complete the mission and advance to the next arena. It’s worth noting at this point that as enjoyable as my jaunt through the worlds was, the bosses are a particular highlight. 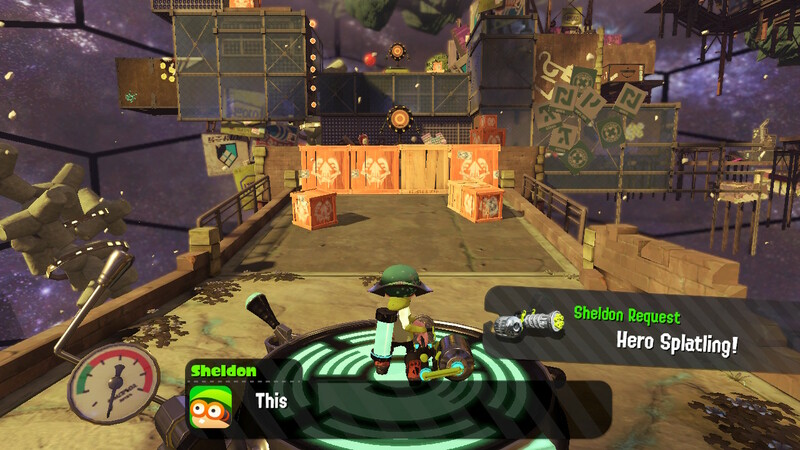 Progressing on to the next world – Suction-Cup Lookout – I was greeted with more of the same, albeit with more missions available and more Zapfish needed to face off against the boss fight. It was again the same for the third world, dubbed Beaker’s Depot. The differences that I found between the world hubs was that more of the mechanics from the missions were coming into play, and the Kettles were increasingly more difficult to get to. 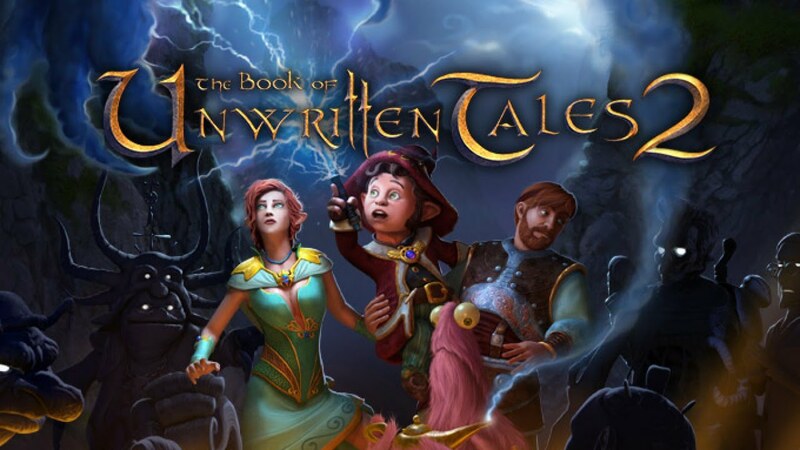 All of the skills learned will be put to the test in order to continue your adventure. 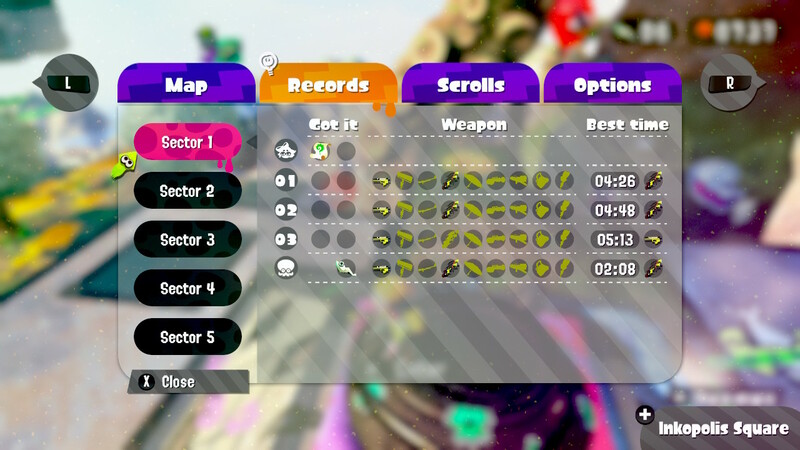 The single player mode gave me a plethora of ink-laden firearms and tools in order to save the day, varying from your standard weapons from the first game – the hero blaster and the roller – to other fabulous pieces like the splat dualies (dual pistols), a gatling gun, or even a bucket. Some missions initially require you to use a specific weapon however, which can prove a little more challenging, especially late-game. All the missions presented to you can be replayed should you choose to either better your previous time, or collect more power eggs (which act as Splatoon 2‘s currency). The latter can be exchanged to upgrade your weapons, unlock new bombs, or enhance your ink storage capabilities. 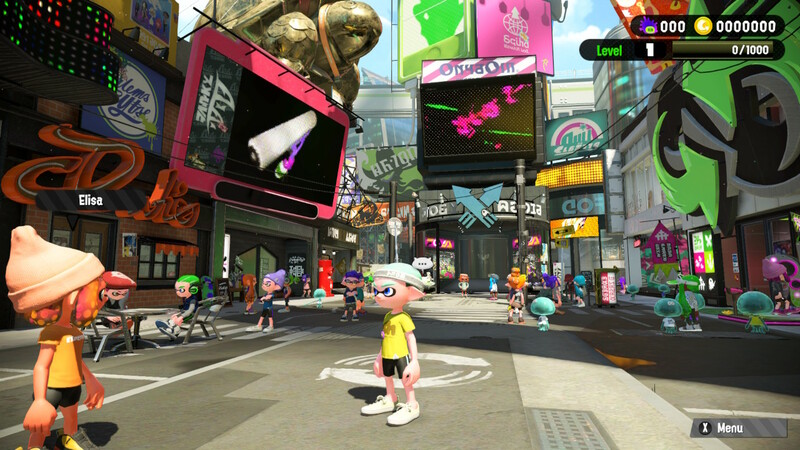 I’d spent many hours with Splatoon 2 by the time I reached the end of the third world, and couldn’t believe how much fun I’d had – or how quickly the time had passed. 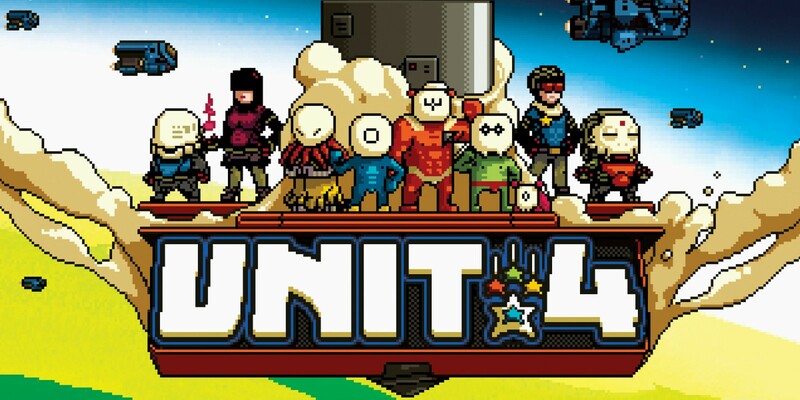 For many this will be seen as a distraction to the real meat and potatoes of the game (the multiplayer focused combat), but for this writer it was a welcome experience… and something I’m not going to neglect once the game is out. Splatoon 2 is out on July 21st, and we will have a review out in time for launch. I am looking forward to this. I’ve never played the the first game and I have a 6 hour flight to San Fran the monday after this launches. Between this and some more Zelda it’s looking to be a fun flight.